(London, England) Is has been the holiday mystery of the ages – the real life existence of Father Christmas, better known to children around the world as the jolliest of elves… Santa Claus. Over the years, the FBI, Scotland Yard, MENSA and the Illuminati have all tried in vain to gather undeniable proof that the man in the big red suit did in fact exist. 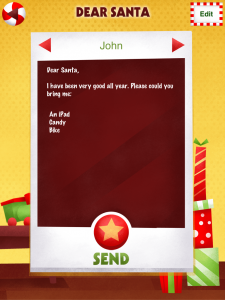 Today, the unthinkable, unimaginable has occurred… through new technology developed by Wet Nose Design in London, undeniable evidence proving Santa’s existence has been uncovered and made available to the world in the form of an app dubbed Santa’s Big Helper, available for the iPhone, iPad and iPod Touch. While typically able to make himself invisible to prying eyes, special patent pending technology inside Santa’s Big Helper will allow you to see Santa himself when he comes down your chimney and create a video of his entrance. This is no faked video – set it up and it will show Santa coming out of your fireplace in your very own house! The patent pending “Elf Cam” to capture footage of Santa in your own home. Of course some of Santa’s magic is meant for grown-ups eyes only and in that way Santa’s Big Helper is any parent’s little helper this season. A password-protected Grown Ups Only section within the app keeps app controls out of the wrong hands, and keeps the spirit of Christmas magic alive! 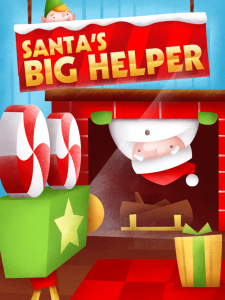 Santa’s Big Helper for the iPhone and iPad is available worldwide in the iTunes App Store for a limited free engagement and will remain available for $1.99 as a universal application. Wet Nose Design is an independent developer of mobile applications, based in the UK. The company was formed to create unique, fun, and engaging experiences on the new generation of touch screen devices. Any rumors going around that Wet Nose Design is actually run by a group of rogue elves from the North Pole are completely unproven and will not be humored by the press people hired to write their press releases even if they are being paid in candy canes and Christmas cheer.